The Think Farm | a design studio! Like a lot of the beauties in the City of Angels, The Think Farm in the process of getting a much-needed face lift. Check out the look of the new site, and then check back again in the coming weeks because we will only be adding more great things to it. For the fourth year in a row, The Think Farm had the privilege of designing the Silver Lake Chamber’s annual member directory. As a result, I get a first-hand view of all the cool businesses and entrepreneurs that make our eclectic neighborhood so unique. It also lead to the campaign design for the second annual Best of Silver Lake Awards. You may have seen the poster up in various establishments around town, from Hyperion Public to Knuckle & Claw to Yolk. I’m going to have to nab a poster for myself before they’re all gone! By the way, you can vote now for your favorite local businesses until September 30 at the Silver Lake Chamber of Commerce website. Nothing makes you feel as legitimate as a book … In this case, a book cover. Though The Think Farm has designed album covers, brochures, and booklets, we’ve never been approached to design an actual book cover until now. The author had a very clear idea of what he wanted so it was a pretty simple design process. I got to hold the prototype in my hands and I was tickled and amazed. “It’s like a real book!” I kept saying to myself. The author, David Giuliano, is diving into the world of self-publishing, and I can’t wait to see the book available for purchase online in the near future. Thanks to Get Rauzi! Editorial Services for the opportunity. My work on the City of Santa Monica’s 2012 Year End Report opened my eyes to the joys of working with local government organizations. Maybe it was beginner’s luck, but I am completely serious when I say this. This year, I had the pleasure of designing the visual branding for the Regional Park and Open Space District of Los Angeles County and am currently working alongside Business Therapy on a brand overhaul for an organization within the Department of Public Health that’s engaged in youth outreach and sexual/relational health education. I’m excited to share more about this later as the project progresses further. Stay tuned! Three Christmases ago, in 2011, my sister Jennifer and her husband Alen started a tradition of creating a custom, photo-based holiday greeting card with the help of yours truly. Their son Jinu was barely seven months old at the time. The “prop” took less than 30 minutes to make and the “photo shoot” took all of 15. If I do say so myself, it helps to have a graphic designer (moi) in the family. It sure does cut down on costs, and you can get as much retouching as you want! Honestly speaking, neither Jennifer nor Alen need much retouching so the retouching — and there has been a lot since 2011 — hasn’t been much about vanity. It might sound like I’m biased but I love these two so much, I would retouch their mugs till the cows come home to make them look like a million bucks if they needed it. The real beneficiary of my skills has been Jinu. As he’s grown bigger and squirmier and developed a mind of his own, my Photoshopping muscles have been increasingly challenged to make sure he appears in the final shot in a greeting card-worthy way. Last Christmas, we had a bigger concept for the card, which I blogged about then. Making it happen with a 19-month-old toddler wasn’t easy. It look lots of coaxing and patience and definitely some Photoshopping to land on this final image that wished loved ones a happy holiday AND announced the upcoming addition to the Kim-Zehnaly clan. Jennifer’s BFF and former Think Farm design assistant Ritzel Quito added the graphic elements to drive the message home. It wasn’t perfect since there were a lot of disparate parts that had to be pulled together and we didn’t have a professional photo set-up. I’d say it was still pretty darn good for a family holiday card! Ok, now to have three novices take on the challenge of interpreting this concept into a family holiday card, with not just one but two little ones! I decided to be a smarter about lighting this year and pulled out old halogen lamps and whatever other clean source of light I could find around. Thankfully, Jinu didn’t knock any of them over. That was the last favor he did for me. It would’ve been ideal to shoot everyone at one go but with the baby puking on her dress, the toddler running around like a terror and three grown-ups simultaneously bossing each other around, that was never going to happen. Instead, I shot one element at a time, grunting and sweating from the top of a 5-step ladder. First, the parents. SO easy! No retouching — doesn’t my sister’s skin look awesome? Jealous! Then, the newest addition to the family: five-month-old Adeline. We got her at just the right moment and she was charming! Shoes on or off, she looked gorgeous! Finally, Jinu of the Terrible Twos. There were tears, there was sweat, there was yelling. Of the four adults (my brother David eventually came in to lend a hand) and Jinu, it wasn’t always clear who was doing which. Those little dots are chocolate chips we used to try to calm him down. Uh, they didn’t work. This year’s holiday card took a marathon Photoshopping session since we got rolling with the project at the end of the first week of December but it got done! My Photoshop skills aren’t good enough to turn Jinu’s frown upside-down but I think it’s the best Kim-Zehanly Christmas photo card yet, and Auntie Helen has earned her keep … Until next year. 2012 provided one of the best branding experiences I’ve had to date in the form of a contest, some very worthy non-profits and a partnership that continues to yield delicious fruit. Helen Kim of The Think Farm and I hatched a plan to offer our services through a social media contest, Make Your Mark, to a Los Angeles-based non-profit as a way to give back to the city that gives us so much. We were nothing short of thrilled by the passionate and socially conscious applicants who worked hard to promote their organizations to become our winner. Sadly, there could be only one. Happily, we were honored to work with some of the incredibly innovative and forward-thinking folks in the Los Angeles Time Banking community on a new kind of community market concept. Once known as the Altadena Urban Farmers’ Market, theirs was an experiment in hyper-localism: a neighborhood market where folks came to buy, sell and trade local products and produce for both federal currency and time dollars. As the market grew in popularity, it began bursting at the seams, requiring a new strategy for growth and implementation, as well as a new identity. Market manager Justin Bilow entered the AUFM into the Make Your Mark contest and handily won by leveraging the market’s various social media communities. I began working with them in April 2012 to dig deeply into their vision, mission, core values and emerging identity. Those foundational elements were then applied to the branding process to identify their target audience, market position, key messaging and new name. With some deep exploration, care and nurturing, the Arroyo Seco Neighborhood Marketplace sprouted from the very fertile minds of some of Los Angeles’ most pioneering folks. The new market is set to re-launch this spring, and they’ll be using the brand platform that M+C helped them create and the visual branding pieces The Think Farm designed to present their new identity, vision and voice to the community they serve. We wish them the best of luck in their new endeavor knowing they have the internal navigation system to reach their goals and the stellar visual branding they need to make their mark. Added bonus: Originally conceived as a brand package giveaway one-off, Make Your Mark has continued to evolve – as all good things do – into a process that M+C and The Think Farm continue with new clients. Stay tuned for our work with another one of the MYM contestants, Viver Brasil! *The title of this blog post is also one of the key messages developed for the Arroyo Seco Neighborhood Marketplace, but it aptly sums up how we also feel about our Make Your Mark experiment. Big thanks to ASNM for letting us borrow it for this piece! Sarah McGowan is the owner and creative principal at MAC+COB Business Therapy. Sarah makes a mean strawberry-balsamic jam. Happy Hump Day, everyone! This is sort of random but I just really, really like this. It reminds me of my childhood Saturdays glued in front of the TV watching Kung Fu Cinema after Saturday morning cartoons. Those of you who grew up in LA in the 80s know what I’m talkin’ ’bout! Hope you enjoy. Make Your Mark Winner’s Logo Complete! Back in spring of 2012 when we announced the then Altadena Urban Farmers Market as the MAKE YOUR MARK winner, we had no idea what the branding journey for such an innovative non-profit organization was going to be like. Juggling the needs of the Time Bank members with the inherent values of the existing farmers market and the vision for things to come in the future was no small task, and the core team of what is now known as the Arroyo Seco Neighborhood Marketplace did a mighty fine job navigating its way through the process. Of course, members of the team had the expert Sarah McGowan of MAC+COB to keep their eyes of the prize as she worked tirelessly with them to develope their brand strategy. By the time the branding brief landed on the desk of yours truly, it was crystal clear where the organization was headed. No longer is it just a farmers market (though, to be honest, it was never “just” a farmers market!). The new and improved Marketplace is just that — a place of innovative commerce, a place of gathering, a place to test, experiment, play and grow as a community. To communicate the idea of the Arroyo Seco Neighborhood Marketplace — which is the coming together of community in both physical place and concept — we initially looked to the past (read: simpler times) for inspiration: storefront awnings, signage and picnic/shopping baskets. We liked how a traditional store sign implied a concrete, physical space but wanted to communicate the fact that the Marketplace is more than just a place. It is about innovation, about thinking outside the box. THEN we thought, why not play on the idea of the box and make it look like a CSA (community supported agriculture) produce box? Plus, we didn’t like how the generic box graphic conjured up ideas of packing up, moving and being either transitory or in transition. As you can see, the “thought bubble” idea continued to be a strong contending concept. … the ASNM is meant to coordinate among the sundry and unique marketplaces under a common theme. This is [well] represented in [the] design … It’s symmetrical centered, and its borders point to four different directions, which can abstractly represent the different neighborhood-level marketplaces. In the end, we chose brown as much for its significance as its visual impact. We are super stoked at what we came up with and can’t wait to move on to producing collateral to promote the new and improved Arroyo Seco Neighborhood Marketplace! Happy 2013, everyone! It’s only the second day of the new year but the pressure to get steamrolled by the urgent is already immense! The discipline to stand aside and reflect becomes all the more critical in these moments, I think. The Think Farm is a small operation in many ways but we’ve had the privilege to be a part of some big things last year. We hope for even bigger things to come in 2013 but here is a look back at some of the awesomeness that was 2012. 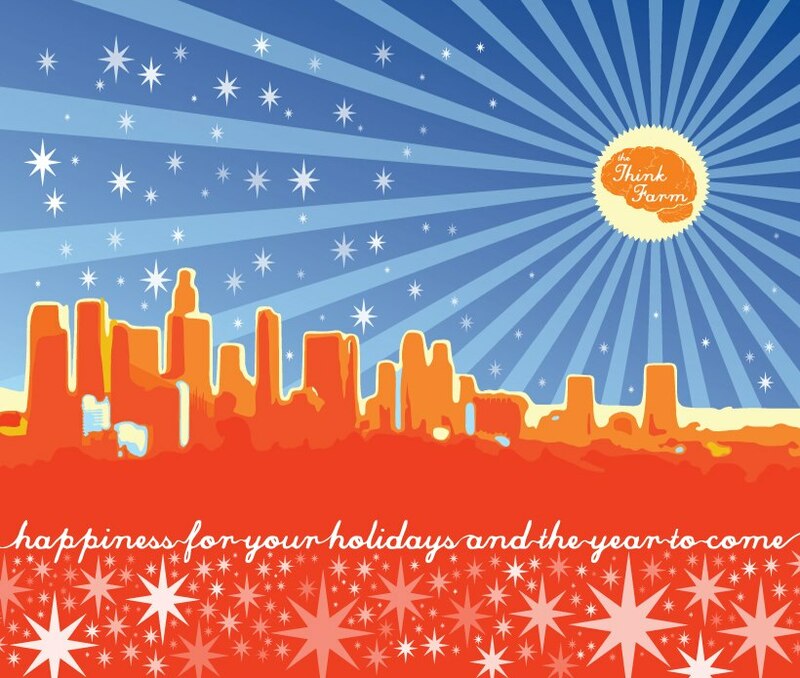 Happiness for Your Holidays and the Year to Come!